Today (March 17th) is St. Patrick’s day! So I thought that I’d share this video with you to celebrate seachtain na Gaeilge - the week of Irish language and culture. Here is some more info about Irish if you are curious. and of course, in Irish!! Today I’d like to share my excellent experience with 360 Esperanto speakers in the north of the Czech Republic with you all! The “IJK” (International Youth Congress of Esperanto) is the world’s largest gathering of young Esperanto speakers (sometimes reaching up to 1000 people), and was by far the best week I’ve had in a long time! Note that this video is not in English. I usually translate my videos to 7 languages, but this is very time consuming for videos that will not be watched as much. So this time it is only viewable in Esperanto (of course), and Czech (both with subtitles). Apart from the relevance of it taking place in the Czech Republic, I made it in Czech to practise the language as part of my experiment to see if I can learn it to fluency in just three months. Note that this post is a copy of the one over at my fluentin3months.com blog. There may be more comments over there. This is a short video (less than 3 minutes long) I made about how to start learning Italian while I was passing through Rome again this year. There’s only so much you can say in 3 minutes, so it’s mostly a light-hearted video that obviously can’t be so detailed and is not to be taken seriously! Most of all, it was a good excuse for me to dress and act silly around Rome! You can watch it embedded through Youtube above in English, or through Dotsub below in Italian with English subtitles. [Note that these may not be viewable in feed readers / for email subscribers, so you might have to click through to my site]. You can also watch it entirely in Esperanto, French, Spanish and Portuguese on this site by clicking the links to the right! As I mentioned in the video, twitter is a good way of practising each day with an Italian status update. Feel free to follow my regularly updated Italian twitter! It is not proofread, so I can’t guarantee that there are no occasional mistakes. How to speak a language fluently in 3 months! Hi everyone!! All of my travels this year (Germany, India, Italy, Ireland and now the Czech Republic) and work in general have meant that I’ve had very little time to edit videos, so I am sorry about the lack of updates to my site!! I have footage waiting to be edited for several videos and I hope to get around to it very soon!! Since I always translate each video to 7 languages, it’s a lot of work!! Anyway, in the mean time I have started another website, that I plan on updating about twice a week (it’s only in English this time!!) Basically, I have decided to learn one of Europe’s hardest languages, Czech, in just 3 months!!! I am blogging about the experience, but not actually discussing Czech itself so much as giving general language learning tips that I’ve picked up as I have learned my other languages, which I am currently applying to learning this new language. Feel free to follow me on my other blog to read all about it at www.fluentin3months.com if you are curious about what techniques I use to learn languages, or are generally curious to follow this experiment and see if I’m successful! You can subscribe on the left of that site, and all comments are appreciated! I’ll be coming back from my blogging break very shortly with some funny short films about how to learn languages; starting very soon with “How to learn Italian”, followed by English and Irish Gaelic and getting into videos about other languages later. I’ll also be giving lots of other travel tips too! So stay tuned and make sure you are subscribed (by email or RSS)! But for those of you who want to hear my best tips now, you can check out an interview that was just taken with me over on the More Oftens podcast/blog. It’s a new podcast by some friends of mine, Zac and Brady. They asked me some interesting questions and I gave some tips for how I travel so much and manage to learn languages quickly. You can see the post directly on their site or download the MP3 to listen to later. Be warned! The entire interview lasts over 45 minutes, so maybe download the podcast/MP3 to listen to later! All comments about the interview appreciated here below or on the More Oftens blog. This video is in HD quality. If your connection is slow, or the video is not loading, you can watch it directly on Youtube in normal quality. It is also originally on Sam’s blog here. I have also added subtitles to the video on the non-English versions of my site. Today I have a guest video post from a good friend of mine, Sam Powers, who I hosted in my house in Buenos Aires through Couchsurfing. He also has a video blog, in which he and his friend William are travelling all around the world on a tight budget and sharing their story in a written and excellently edited video blog. Even though he recorded and edited it, I still feature highly in the video, so it’s only appropriate to include it here! We show you an incredible event that we were a part of in Buenos Aires; a pillow fight that thousands of people took part in! It is what’s known as a flashmob; where hundreds or thousands agree to meet (in this case, with the help of a facebook group, other sites and word of mouth) and do something crazy to confuse the general public and have a great time. The result; 2,000 people and a huge pillow fight! Many, many thanks to Sam for sharing this video with us! If you enjoyed this video, leave a comment below (or on Sam’s Blog!) and don’t forget to subscribe to our blogs to see more of our videos! What is RSS and how is it useful? This video is in HD quality. If it is not loading or you have a slow connection, you can view it directly on Youtube here. This video is also available in Spanish, French, Portuguese, Italian, Esperanto and Irish! Have you ever wondered how to subscribe to updates on a website? Have you ever seen this symbol on web pages and wondered what it means? RSS is all over the web, but so many people don’t even know what it is! In this short fast-paced video I explain it as I run around Buenos Aires and show how it can be used. Some important links that you should refer to after watching the video include how to use Google Reader, and Google Alerts for RSS feeds on Google searches, and everywhere else just look for the RSS symbol or something similar! If you like this video, make sure to leave a comment and of course… don’t forget to subscribe to my RSS feed!! This video is in HD quality. If it is not opening or you have a slow connection, access it directly through Youtube. Before I get into sharing my funny and practical video ideas for this year with you, I thought I’d kick off the year by showing how I started it! This 1 minute video (in Esperanto, with subtitles) shows me in my ridiculous costume that won the “most catastrophic” costume of the Internacia Seminario event, followed by the countdown to 2009. If you’d like to see more of what happened that week check out the full video (about 4 minutes) on my Esperanto blog and change “Esperanto 100%” to “English 100%” for English subtitles in the video. You can also see a very funny Jerry Springer sketch (also with English subtitles) that we did, in which my gay character’s boyfriend had a secret to confess! All videos of the week can be seen on my flickr account. Leave comments if you like it! This video is in HD quality. If you have a slow connection, you can watch it in normal quality directly on Youtube. This video is also available in Spanish, French, Italian, Portuguese, Esperanto and Irish! I was living in Buenos Aires for a few weeks so I took the chance to learn a little about the famous dance, tango, which is hugely popular in Argentina and Uruguay. I managed to master the basics and learn a few things about tango culture, so I made this short video (3:33 long) to show my progress! Many thanks to my instructor María José (“Majo”). If you enjoy it, make sure to leave comments and subscribe to see my future videos! You can also watch this video in Spanish, French, Portuguese, Italian, Irish and Esperanto. For the last week in August, this normally barren desert is occupied by 50,000 people for the “Burning Man” event. It’s very difficult to describe what the event is about, but hopefully this short video will give you a slight idea! This year I found out about Esperanto, the international and neutral language, which is also the world’s easiest to learn. It encourages open cultural exchange without preference to any particular speaker. I very much liked the idea, but I wanted to see if it really worked! So, I signed up to the first international Summer Esperanto Study program in Slovakia, which was organized by Lernu ; a website for learning Esperanto for free. I saw an international community that I never knew existed. I found out that Esperanto isn’t just a language; it’s people and ideas that work together. I hope that this video shows exactly why this was only the first of many Esperanto events that I will be going to. If you would like to see more, there are photos and all the unedited videos on my flickr profile. If you liked this video, please leave comments! This month, Aragón Radio in Spain got in touch with me to find out about my story. They found my blog online and wanted to know a bit more about my travelling and language learning experience. You can listen to the interview (in Spanish), and/or read the translation below. Many thanks to Toni Ruiz and Lidia for this great opportunity and for the interesting questions. Click here to listen to it as you read the transcript (11 minutes long). Toni: Our next guest’s blog has a title that reminds us of this series; it’s called “Around the world in 80… Mays” (years)! We have this story’s main character on the line! Benny Lewis, how are you doing? …. Hello, welcome to Aragon Radio, how are you doing Benny? Benny: I’m very well thanks! Toni: Nice to meet you! So, “Around the world in 80 Mays” Are you going to spend your entire life travelling? Benny: Well not my entire life, no. The name sounds cool that’s all. But I’ve already been travelling for 6 years straight and I’ll be continuing for maybe 5 or 6 more. Toni: 5 or 6 more years, so around 12 to 15 years in total then? Benny: Yes. The thing is, if you travel so much, you realize what’s important such as family, and some day I’d like to settle down. But it is possible that I spend that much time travelling now that I know how to. Toni: Benny, you were born in Cavan, a town in Ireland, and you always go back there between travels. When did you start this travelling adventure exactly and why? Benny: I spent summers between university years in the states and had quite a good time. So when I graduated, I went to Spain. I was originally only going to stay for three months. But I liked it so much that I decided to stay for a year and I really worked hard to learn the language. After the year, I asked myself why can’t I just do the same thing over again; travel, spend a year in a country, learn its language and move on to the next one. Toni: So, your trip to Spain really changed your life then? Benny: That’s right. 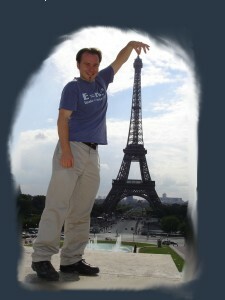 It was the first time that I really lived abroad, since I was more of a tourist in the states. Toni: So you prefer to stay longer in a country and learn about its culture… so if someone wants to get to know a country, even just a little, spending a week there just can’t be enough, right? Benny: Oh, definitely not. I’ve discussed this at length with other globetrotters; “what is the difference between a traveller and a tourist”? If you go somewhere for just a weekend, you don’t see anything really. For example, I spent 9 months living in Paris and in a weekend I basically showed the best of the city to my family and they loved it. But in the rest of the 9 months I really got to see what daily life was like for Parisians and even tried to live like they do. I do this each time in every city I visit. Toni: Benny, you speak seven languages at the moment, is that right? Benny: Well… I prefer to say that I can “get by” in 7 languages! Toni: If you “get by” like you do in Spanish, then that’s quite impressive!! Your Spanish is fantastic! Benny: Ah, thanks!! Yes, the others are more or less the same level as my Spanish. Toni: So you have a talent for languages then, it’s even a part of your work now, isn’t it? Benny: Right now it is… but when I say I speak seven languages, people think that I was born with natural talents. They always say “What a pity I’ll never be able to do the same!” But actually, I never did well in languages in school, and when I first went to Spain I only knew a few words like “hola” and “siesta” and that was it. But I always carried a small book in my pocket to study whenever I would be waiting and I really tried hard to reach a higher level and I avoided speaking English; that is quite important. I know a lot of travellers that say that they just can’t learn languages and it’s because they travel with their friends from home or boy/girlfriend or whatever. That’s why I try to always speak the language of the country and after a year anyone in the world can learn a language if they try hard enough. Erasmus students do it all the time. The only thing that’s a little impressive about me is that I repeated the process 6 times over! Toni: Benny, give me the address of your blog so our interested listeners can check it out. Benny: Yes, the name is just “políglota irlandés” (Irish polyglot) but in English. Toni: And here I can see “The Hike up Mount Teide”! Benny: That’s right; I always dreamed about living in the Canary Islands. My interest in Spain began when I was a teenager and Spanish students from there spent the summer in my town to improve their English. So this year I finally made it to Tenerife, and I didn’t quite know what to expect, but on the very first day I made friends, went to a party and even found an apartment. Some locals invited me to hike up to the top of the Teide with them and the experience was so unforgettable that I recorded it with my camera and edited it in the style of a documentary, and it can be watched on my site; I’ve gotten great feedback from it, it’s only 6 minutes long and I added music and Google Earth animations to show each step of the journey from space. The blog is for showing everyone how my travels are going using videos and soon I am going to go into more detail explaining how I do it all; learning languages and travel so much etc. Toni: This is all very interesting!! So tell me something; it must be very expensive travelling around so much? Benny: That’s what they say. I’m always asked if I won the lotto or if I have rich parents who pay for everything, but honestly, you can travel around the world with very little money. I usually only have a couple of hundred Euro to my name. What’s much more important than earning large amounts of money is learning how to spend the money you have well. I don’t have a car and I don’t buy a lot of unnecessary items for example, so when I go to a country and look for work, it may not pay that well, but I always have enough to buy a plane ticket with Ryanair or Easyjet or any other cheap airline and go to the next country and start over. Toni: And on top of all that, you are an active “Couchsurfer”, aren’t you? That’s something that we have always been fascinated by here. Benny: Yes, Couchsurfing really is interesting. It’s another way that you can travel around without spending much. There are travellers that return home to their daily lives but want to somehow keep the travelling spirit alive in them and meet other globetrotters without having to travel themselves. So they make a profile on Couchsurfing.com and host people in their houses. The guests don’t have to pay anything of course. There are a lot of good security features so you know you won’t have any problems, so each time that I start off in a country I spend a few days staying in the house of someone from the city itself and not in a hotel or youth hostel, which may be lots of fun, but you will only end up meeting other foreigners and of course, you will spend a lot more. Then, if I decide to spend a lot of time in a city, I’ll rent my own place and let couchsurfers stay in my house. Usually I’ll have a a spare bed or comfortable couch for them and for me it’s great because I get to hear all of their stories. Toni: That’s great! So, today we found out about the amazing story of Benny Lewis, a full-time globetrotter!! It’s been a pleasure, many thanks for your time and we wish you the best of luck in your future travels! Benny: Thanks to you, it was my pleasure! Here is a video documentary about my experience hiking up the Teide with locals from the island. I used some new editing techniques and included 3-D Google Earth shots to show exactly where we were at each step. Please do leave comments or contact me to let me know what you think about it!! Where the hell is Benny? One day last summer, it was my honour to dance with Matt, an Internet superstar who made one of Youtube’s most viewed videos of all time. He has just uploaded his third excellent and inspiring video about travelling around the world. It’s only 4:29 long and well worth a watch, but check out 3:51 (Montreal) and see the guy in the yellow jacket waving his arms, right in the centre of the shot? A page to directly contact me through the site. Side menus for language selection, viewing my microblog twitter feed, etc. Automatic language detection!! I quite like this one; entering the base address www.irishpolyglot.com will automatically give you my site in English, Spanish, French, Italian, Portuguese, Esperanto or Irish based on your browser’s default language setting. If you select a language other than the default, then it will be saved for your next visit! Each page is entirely in the selected language. Not just the posts, but the site’s date-format, clickable buttons/links, headers etc. From an administrative point of view, I’ve done most of the work coding the site so adding a new post is easy and I can do it more often. My work is far from complete, but it’s a great improvement on the previous version!! As far as design on the site itself goes, I still have to tinker with the overall page layout and design until I find one that I like (not this one), write a good “About me” page and iron out a few minor problems. Why all this work? What will I be using this site for? At the moment all posts are only about my travels since late last year; hardly interesting to anyone who doesn’t know me, although I will continue to write about where I am. The reason I’ve put so much work into improving the site is because eventually I’d like to get lots of visitors for other articles that I’ll be writing. In the last 6 years that I’ve been travelling I’ve learned a few things and can give some general travel tips and language learning tips. Also, I’ve been on the net since 1993 and am online nearly all day, and like to keep up to date with the latest developments out there when not travelling so I have a few very useful web 2.0 secrets I’d like to share! Otherwise I’ll be writing about things I believe people would like to know about, and hopefully the site will naturally evolve into something really worth a visit one day. Hello!! Today I am working on an entirely new website design using WordPress technology. There are a lot of complications (somehow managing the separate languages of my site, getting used to the new set-up and tailoring it to my tastes and adding a much nicer theme than there is now etc. ), but slowly but surely I’m getting there!! After less than a week back in Ireland, I was ready to head off again! I got the first flight to Tenerife and a few hours after arriving, I found a flat, friends and got invited to a party! I had a nice place to myself so I could get some work done, but went out regularly with the Erasmus crowd. I even took the time to hike up the Teide, the world’s 3rd tallest volcano, and get to know the island and its locals and customs. And of course, I got some regular sun and will be leaving with quite a decent tan! But once again it’s time to go home!! I’ll be giving Maths lessons to save up for this years long-haul flights and for the weeks I’ll be travelling without earning. I’ll end this entry with a link to something you might like. At the airport, on my way to Tenerife, I was interviewed by Irish national radio about Couchsurfing. For those of you who want to hear it just click here. It’s only a couple of minutes long and my part is at the beginning. After two years it was finally time to go back to Brazil. This experience was to be completely different to the first one; the city of Recife was my first stop at 2,500km from Rio and São Paulo. The house I was renting was in a “favela” or city slump, where I’d feel constantly aware of how white I was every time I left the house. I quickly learned not to leave home with any valuables, or even a wallet, with about R$20 (€8) stuffed into my pocket I’d be covered for all food and taxis out and back home. Recife has a reputation for being a very dangerous city. Despite that, nothing happened to me or anyone I knew the entire time I was there. The Carnival itself was spectacular. See the video a couple of entries before for my experience. Olinda (Recife’s adjacent city) has one of the world’s craziest Carnivals and I’m so glad I got to experience it! After a month it was time to set off to travel around the north-east. I started at Natal, a city simply named “Christmas” in Portuguese, where there are Christmas trees and wise men everywhere – even in March! A very clean and modern city; it gets a lot of European tourists. While I was feeling touristy I went to Pipa for a few days; its a beach town mostly populated by travelling surfers and those who want some good parties. Continuing south, I went past Recife onto Maceió and then down to Salvador for a while. Salvador was Brazil’s first capital and has a long and interesting history; it’s an amazing city with so much culture and with so many friendly people. I took a few Capoeira lessons and went out to explore the city as much as I could. Since it was almost time to go home I decided to chill out for my last few days on Morro de São Paulo; an island close to Salvador. I found a “pousada” (cheap hotel) with breakfast, air conditioner, queen sized bed, my own terrace, en-suite bathroom and 10m from the beach and was able to haggle the price down to R$25 (€10) a night! But all good things must come to an end; I got the 14 hour bus ride back to Recife to fly home. It’s not the last Brazil has seen of me though!! I hope the above video best summarises how it was! It took me a while to get around to editing it, but finally you can see how 40+ Couchsurfers got along together in the house I hosted them in, February this year in Recife Brazil. Enjoy! 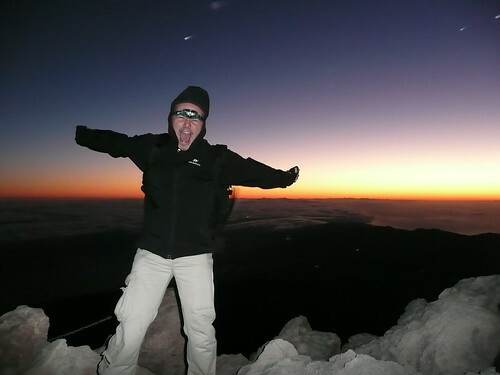 Hiking up the Teide, Spain’s tallest mountain and the third largest volcano in the world. I’ll also be dramatically altering the website’s layout; adding a main front page for language selection, organising the site into menus and adding more content that is easy to navigate through in all languages. Right now it’s horrible having everything on one page. That will change soon! I’ll also be adding descriptions of my travels since January that aren’t covered in the videos if anyone has the patience to read them! And if I get my head around the coding I’d like to add an RSS feed for those interested in keeping up to date. Otherwise I’ll be starting a simple e-mail list. Oh and I’ll also have an e-mail with the site’s url to be more easily contacted For now, enjoy my first documentary in the previous entry. My first documentary in Brazil, about the Carnival in Olinda. I give a few insights into local customs and interviewed a few people in the street (subtitles included). Camera: Rahul Kapoor – India. So, feeling more pride about being Irish than ever, it was time to embark on another trip; but this one wouldn’t take me as far away as usual. My aunt in London was going to Australia for almost two months and she needed someone to take care of her big, ideally located house. Since I love her so much, I decided to make the sacrifice and volunteer myself! If it wasn’t for this house-sitting, I never would have took the time off my linguistic voyage through the world to spend two months speaking only in English, in England of all places, but I’m so glad that I did now! London really is an amazing city and I’m so glad I got to know it. I was living very close to Hampton Court, the palace used by Henry VIII, England’s most famous king; the one with 6 wives (divorced, beheaded, died, divorced, beheaded, died) and the one who changed England from a Catholic country to a Protestant one… only so he could ignore the pope and legally divorce the first wife! As you can see I’ve been getting into British history a lot and being surrounded by it all these physical remnants of it has been fascinating. Here’s a little video I did about why Oxford Street became such a popular shopping district. I was thinking of using this website to link to other videos along my travels, for some kind of travel documentary of cities that I am currently living in. This one was just an experiment; I’ll be trying to make a few while in Brazil (and will translate to the languages indicated above) and any opinions/advice will be appreciated! going out and generally having fun! I did most of the site-seeing with Marlène, a friend from Québec. Since my brother lives in London I got to see him regularly too. See my London photos to get a better idea. Some of my favourites are the celebrity ones from Madame Tussauds wax museum, and my visit to Greenwhich to see exactly where the 0° meridian is that separates the Eastern and Western hemispheres, and from which all world time is compared to. I ended my time in England getting the ultimate souvenir. 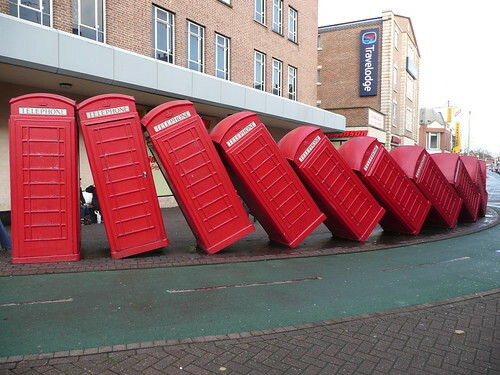 Some people might get a novelty red telephone box or a teddy queen’s guard, and me…? I got a British passport!! Simply because I could (my dad is English) and because a second passport comes in hugely handy in travels for extending visas, if you lose one, or if one is preferred over another etc. Despite English family and the dual citizenship, I’ll always consider myself 100% Irish though. I’ll always use the Irish passport as the main one. 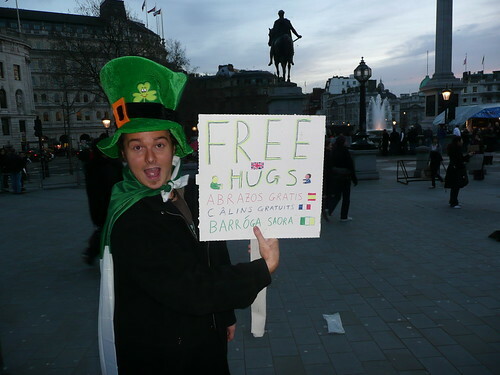 My last weekend in London I took part in the free hugs campaign and made sure my sign included Irish (among other languages), and I even wore a leprechaun hat and an Irish flag as a cape, just in case anyone would doubt my Irishness! So it’s been fun indeed!! But it’s time to continue the adventure elsewhere. In a few short hours I’ll be flying to Recife, in the north-east corner of Brazil. The current plan is to rent a room in a house for a month there, enjoy the Carnaval in one of its most famous cities for the party atmosphere (Olinda, 10 minute bus-ride away), and then travel around the north-east of Brazil until April! This time there will be hugely different to my previous one. Recife is almost 2,000 kilometers from Rio, in a poorer part of the country, where I will hugely stand out with my white untanned skin. It will be an entirely new experience. But that’s what makes it fun! All news, photos and videos will be linked to on this website over time, so stay tuned!! Feel free to give me some advice about this website; I know it’s very cluttered right now, I’ll be working on that. Hopefully it’s not too hard to read! Thanks in advance for any constructive criticism! Since I came back from Canada in September, I’ve been entirely in Ireland and England. it’s the longest stretch of mostly speaking English I’ve had in 5 years, so it’s time to get back to some Latin sunshine and in a few short hours I’ll be on my way to Brazil!!! But I can honestly say that the last few months have been genuinely fun. When back in Ireland I decided to use the time, after years in other countries, to finally get to know my own country. Until then I basically just knew my Dublin, my own town; foreigners I met in travels who spent a week in Ireland would know it better than I did. So I decided to take an entire month to travel around the entire West of Ireland. I started in Co. Sligo and a week with my little sister at her university in Sligo town; all of this time I was mostly working too. All I needed was to plug myself into the net and I was translating away. After time with my little sis, I spent another week with my big sis! She lives not too far away, in the same county. 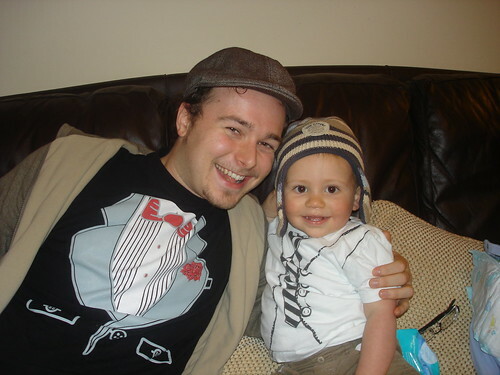 It was a great opportunity to finally spend time with my nephew Eamon. With the house empty all day long, I could continue working. At this stage I had earned enough for the month to actually set myself as unavailable and enjoy a real holiday for the rest of my travels. So next I was to go to the Northwest up in Glencolmkille Co. Donegal for a weekend course in Irish; the rest of my trip was concentrated on going to regions where Irish was spoken so I could practise it. But just before this I decided to check out Halloween in Cork, Ireland’s second city and now in the very south of the country. Unfortunately the best costume I could come up with was Ken, and Barbie ended up ditching me! I always expected other cities in Ireland to just be smaller versions of Dublin, and I don’t even like Dublin that much. 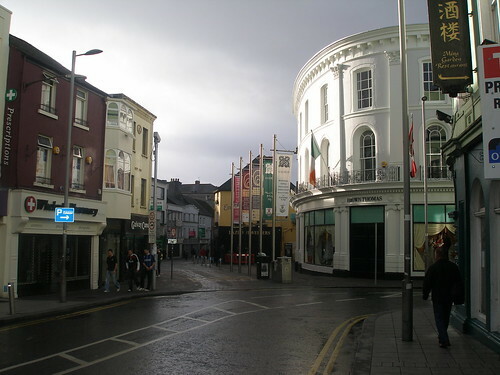 But I found Cork to be hugely different with its own personality and much more European with its tiny side-streets and outside cafés. Onward to County Kerry and the westernmost point in Europe; I started in Dingle, a supposedly Gaeltacht (Irish speaking) town, but found it so overrun by tourists that I went to the end of the road, stuck out my thumb and hitchhiked until I got to Ballyferriter; and really heard some Gaeilge. Next, I bussed up to Galway city and was hugely impressed. I stayed a week and soaked in the University atmosphere, the city nightlife and getting to know some locals as well. As far as cities go, it’s not terribly huge, but I found it to be very Irish while maintaining a modern feel. I took day drips out to villages in Connemara, and saw the language more alive than ever. I had lunch with a friend of my mum and the whole family only talk “as Gaeilge” together. The countryside is outstanding. If I were to ever settle back in Ireland, this region would be the one I’d choose. There is still a lot to discover in Ireland, but I feel like I’ve gotten a good start. I even got to bring out my language interest in travels and get exposed to a lot of Irish, and see it alive, well and growing. Here are a few photos of that trip.